Rashida Tlaib (D-Mich.) has a lot of "firsts" to her credit. She is the first Palestinian Arab elected to the U.S. Congress. She is one of the first two Muslim women to be elected to Congress. And now she is the first member of Congress to make a fraudulent claim about her own grandmother in order to score points against Israel. Appearing on CNN's "State of the Union with Jake Tapper" on March 17, Tlaib was asked about her claims that "racism" and "Islamophobia" were the real motives behind the widespread criticism of the recent anti-Semitic remarks by Congresswoman Ilhan Omar. Rep. Tlaib responded to Tapper that both she and Omar had become "an easier target" because they are "very vocal against human-rights violations, especially in the country of Israel ... we are coming from a place of personal experiences, as being people of color, with my living grandmother in the West Bank in the occupied territories, that we want to be heard and we want to be seen." Notice the crucial role that Grandma plays in the congresswoman's argument. 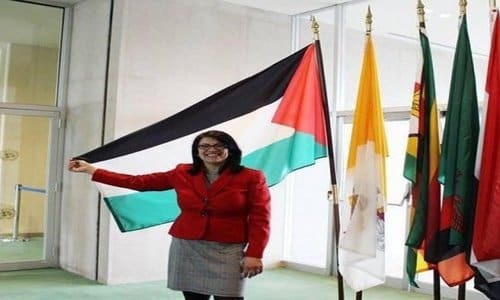 Tlaib knows that if she is perceived as just another Israel-basher, her attack on alleged Israeli "human-rights violations" would carry no weight. So, she has to prove that she has some special insight or connection, something that gives her claims credibility. That's where Grandma comes in. Rep. Tlaib wants to make it clear that she is not just some garden-variety Israel-hater. No, she declared, she is "coming from a place of personal experiences." Well, that's different. She has a personal case against Israel. Now, keep in mind that Ms. Tlaib was born and raised in Detroit. Residents of the Motor City don't have too many "personal experiences" involving Israeli policies. So Tlaib has stretched the meaning of the term "personal experiences" in order to build her case against Israel. She means that she has a grandmother who has "personal experiences." Somehow, that transfers to Tlaib herself. Tlaib understands the power of grievance rhetoric. Once she says, "my living grandmother [is] in the West Bank in the occupied territories," that changes the whole dynamic of the debate. In fact, it's a "two-fer": Her own grandmother is an "occupied," persecuted person, which gives Tlaib standing; plus, it's her "living grandmother," so she's a real live eyewitness, which presumably gives Rep. Tlaib's assertions even more validity. Grandma Tlaib is a resident of the Palestinian Arab village of Beit Ur al-Fauqa. The Israeli occupation of that village ended in 1995. It has been governed by the Palestinian Authority, not Israel, for the past 24 years. For the congresswoman to claim that her grandmother is "occupied" by the Israelis--and therefore a victim of persecution and an eyewitness to Israeli "human-rights violations"--is, simply, a lie. Arafat agreed that a portion of the non-residential agricultural land which Beit Ur al-Fauqa claims belongs to it would be assigned to the area under Israeli security control. Prime Minister Rabin requested this arrangement because that area is dangerously close to the Israeli towns of Beit Horon and Givat Ze'ev, and Route 443, a highway where Israeli automobiles are often subjected to Arab terrorist attacks. But the residential portion of Beit Ur al-Fauqa, as well as the rest of the adjacent agricultural land, has been under the rule of the P.A. for more than two decades now. Grandma's house is not occupied. Maintaining the myth of "the Israeli occupation" provides a convenient punching bag for those who are hostile to the Jewish state. It makes it seem as if Israel is the bad guy, as if Israel's behavior is the obstacle to peace. But that's a lie. Congresswoman Tlaib is absolutely right that there are human-rights violations in her grandmother's village, but they are violations committed by the P.A. and its leadership. For example, the P.A. refuses to permit Grandma Tlaib and her fellow residents to vote for their town's leaders. Beit Ur al-Fauqa has been governed since early 1996 by a group of 11 administrators appointed by the P.A. So much for Palestinian democracy. Please, Congresswoman Tlaib, enough with the lies. Stop lying about the non-existent "Israeli occupation." Stop lying about the "Israeli human-rights violations" that are actually committed by the PA. And for goodness' sake, stop lying about your own grandmother.